Ah—it’s Tuesday and if you have been around It’s Just Life for any length of time you know it is Teapot Tuesday where I highlight a teapot from my massive collection. 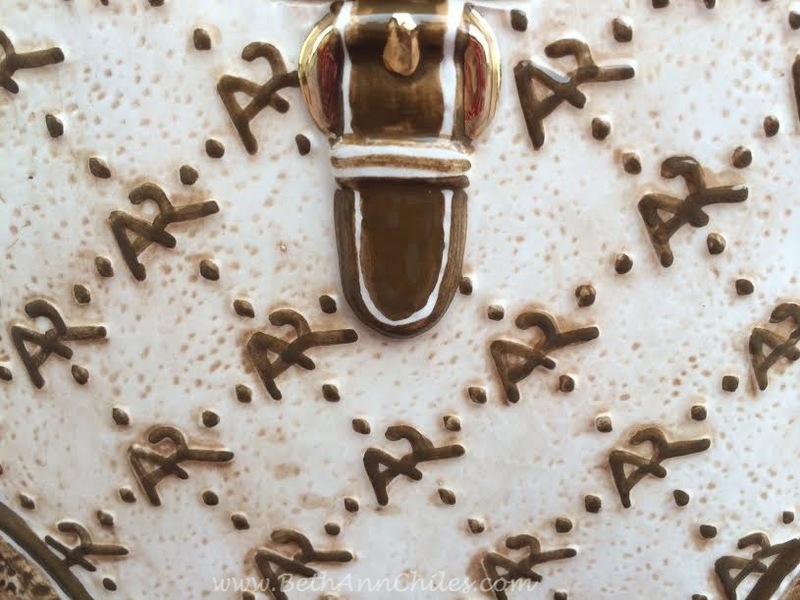 Today’s teapot is a lovely purse themed teapot—one that is an Annie Rowe Collectable and purely decorative and not functional.. It’s a fun one, don’t you think? It is a lovely little pot and I was happy to find it on Ebay awhile ago to add to my collection. What do you think? Just look at that little latch on the front of the teapot. Perfect. 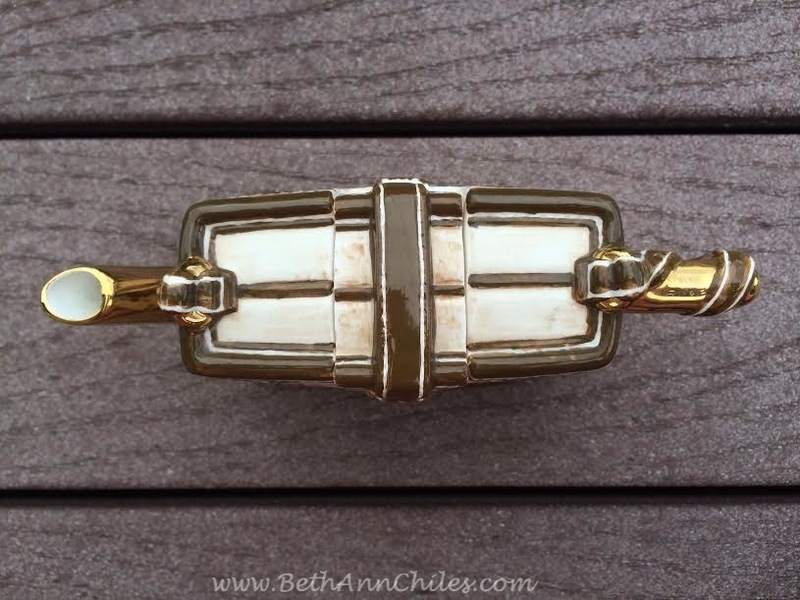 When I look at this one I think of one of my first online blogging friends, Bernie, from One Mixed Bag. Bernie hasn’t been blogging lately but one of the things that she is “famous” for is her purse collection. She has quite a few amazing ones including this chicken one that she was carrying when we met up one time at the Minneapolis airport. 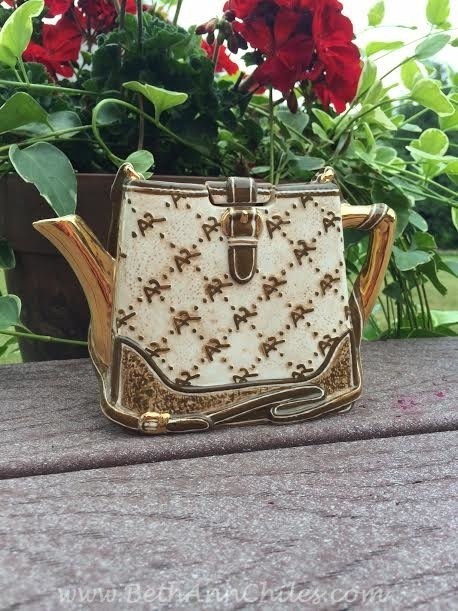 Now my purse teapot does not compare to any of Bernie’s great purses in her collection but it makes me smile and yes-it does make me think of her when I see it on my shelf. It’s amazing to me how many people I have met through blogging that I never would have met if I had not started this endeavor 10 years ago. The best part is when I get to meet them in real life. In all cases they turn out to be even more amazing than I had imagined. So today as I gaze upon my Annie Rowe purse teapot I think of all of you out there in the blogosphere and give thanks for you and for our friendship. Imaginary friends are just the best. Don’t forget to leave me a comment in the comments section today. All comments this month go to help support the Friends of Hunting Island. You can read more about that by clicking here. That is adorable! I’ve never seen a “purse teapot”…or a “chicken purse”! I agree that meeting fellow bloggers is so much fun. I’m looking forward to the time that you and I can meet in person! Me, too! I thought it would have happened by now but life has gotten in the way somehow. Ugh. but one of these days I will meet you and your sweet Motor Man in person. Thanks so much for stopping by! Everyone likes a nice purse! And this one is perfect as a teapot. Love the chicken purse too. Do you have a shoe teapot? I´ve often wondered. Love the song and it is so true! I do not have a shoe teapot. That’s one to look for, right? Always look forward to teapot Tuesday! Love to see your many teapots. Will you be at Lakeside this year? Thanks for stopping by! Yes! We will be at Lakeside this year–same place on Sycamore that we have been for years. Coming up on Saturday so hope to see you guys! It looks like a designer bag for sure. And that makes me happy! Thank you for thinking of me! I haven’t thought of Bernie in a really long time. Thanks for reminding me of her beautiful personality, smile, humor and, of course, those purses. And, yes, meeting bloggy friends (like you) in real life is a gift, an absolute gift. Oh my gosh, that is so cute! I And Bernie’s chicken bag is a hoot! Or should I say it’s quite clucky? Somehow I missed your post yesterday, so I’m glad I saw it today.